During the restoration of one of the Queen’s paintings, a team of restorers discovered something quite surprising: a man squatting in a corner answering a call of nature. This behaviour is not normally associated with the Queen or Buckingham Palace, but the painting containing the man in question will be on full view to the public during a forthcoming exhibition. For over 100 years this figure had been hidden by overpainted shrubs, which is thought to have occurred in 1903 when the painting was last restored. The restorers believe this modification was made to preserve Edwardian modesty. 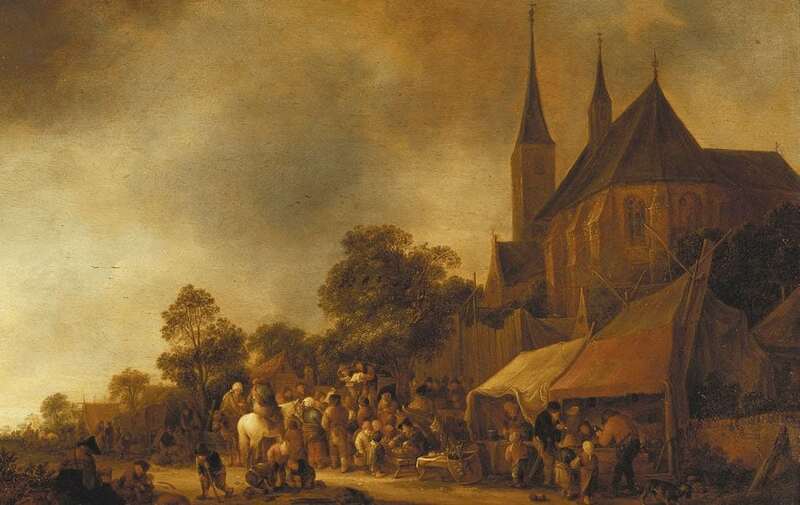 The painting, called A Village Fair With A Church Behind, was painted in 1643 by Isack Van Ostade and depicts a typical Dutch market of peasants trading on the streets. The artist sadly died 6 years later at the tender age of only 28 years old. George VI came into possession of the painting in 1810 when he was Prince of Wales. He enjoyed Dutch paintings which displayed comic interpretations of peasant life. The 17th Century Dutch painting was being worked on in preparation for a new major exhibition which opens to the public on November 13th. The exhibition, Masters of the Everyday: Dutch Artists in the Age of Vemee will firstly showcase the Queen’s 27 Dutch masterpieces at Buckingham Palace before moving to the Mauritshuis gallery in The Hague.